An image on the Jeep Scrambler Forum site shows a tarped vehicle with a Jeep Wrangler-esque nose. The folks at JeepScramblerForum.com -- who've been right on top of flushing out the details of the Jeep Wrangler-based pickup scheduled to make its debut this month at the Los Angeles Auto Show -- now say they're probably going to have to change the name of their website. That's because they believe the pickup's name will be Gladiator, a callback to both the 1963 Jeep Gladiator pickup that debuted at the same time as the original Wagoneer as well as the ultra-popular 2005 concept pickup that ignited calls for Jeep's return to the segment. The forum's fans have also used frequent spy photos to craft realistic renderings of the coming pickup, though their accuracy can't yet be verified. This week, about 100 workers are assembling pilot builds of the 2020 Jeep pickup on the retooled former Wrangler line in the southern half of Fiat Chrysler Automobiles' Toledo Assembly Complex in Ohio. Full production likely won't begin until after the first of the year, however, and dealers have been told to expect the pickup in their showrooms in April. The former Wrangler line has been shut down since last April for retooling after Wrangler production was moved to the other half of the plant. The pickup will debut Nov. 28 at the L.A. show. Earlier posts on the forum say the pickup will get "next-generation advanced safety systems." That could mean it will have creature comforts, such as adaptive cruise control, as well as autonomous braking. 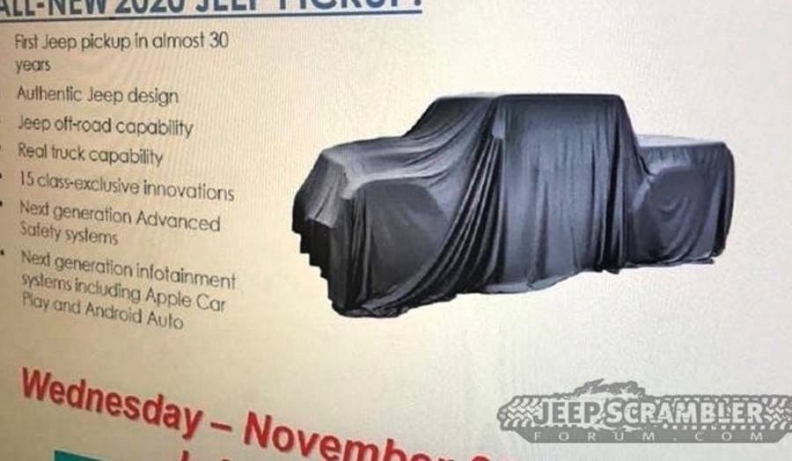 A leaked teaser that turned up on the Jeep Scrambler Forum shows that the still-unnamed 2020 Wrangler-based pickup will debut Nov. 28 at the Los Angeles Auto Show. It also says the truck will have an "authentic Jeep design" and "Jeep off-road capability." While we haven't seen a camouflage-free Jeep pickup, the teaser outlines squared-off, Wrangler-like fender flares. The tarped vehicle also shows a Wrangler-esque nose and cab design. The teaser says the pickup will get "next-generation advanced safety systems." That could mean that it will have creature comforts such as adaptive cruise control, as well as autonomous braking.